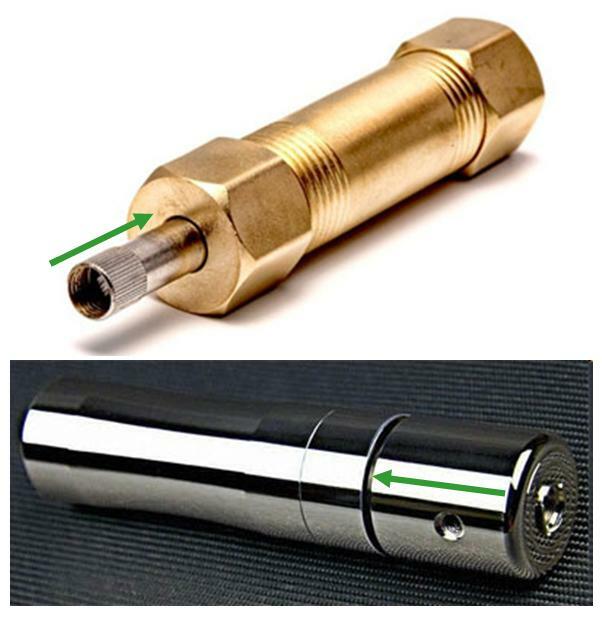 The primary additional capability available today is juice feeding: side, bottom, or AVS (between the mod and the atty). 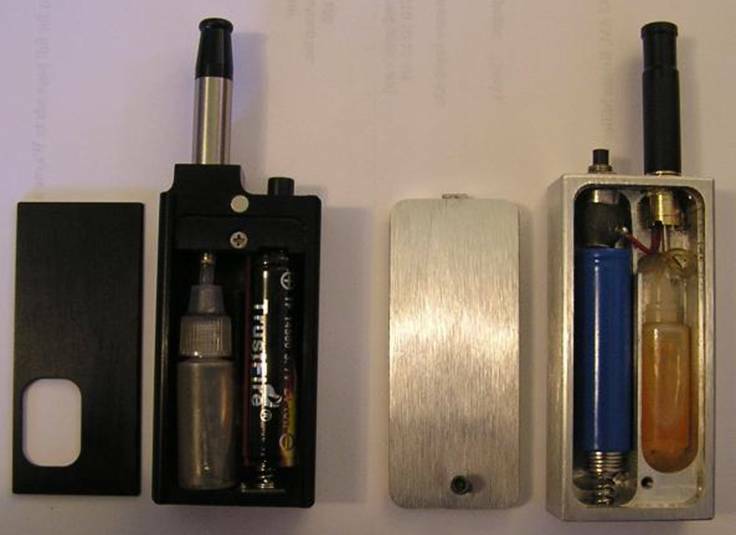 All but AVS are box mods containing a bottle of e-liquid (and the battery, of course). A juice-fed mod replaces the need for cartridges and cartomizers, as well as dripping or dipping. Necessarily, they are larger (usually wider rather than longer) than mods using the same battery. The main example of a commercial side feeder today is the small, inexpensive $45 MrPuffer MP1. (14500 battery, 3-ml bottle). NotCigs sells The Dripper accessory ($15) for its Buzz (or many other tubular mods). 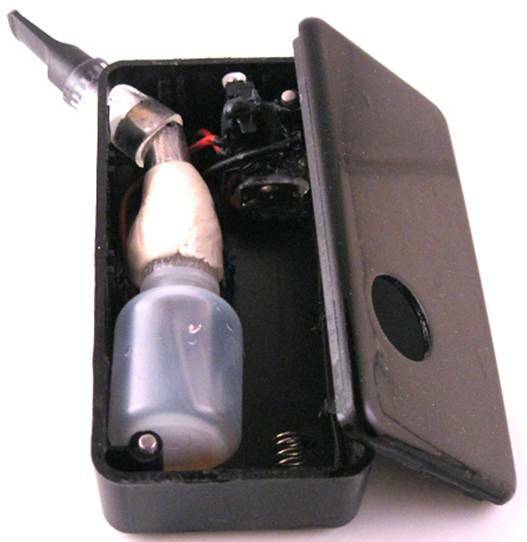 The first bottom-fed mod was Carlos’ JuiceBox, still available for purchase (e.g., $95 at that linked supplier). …as does the similar looking £65 Integrity (which also can accommodate an 18650 battery) from UK-based Dave’s Devices. The $80 GG AVS (Automatic Vaping System) is a 6 ml liquid tank, which attaches to the top of the $159 GG Telescopic Storm shown here. The atomizer sits inside that liquid tank surrounded by e-liquid, which is automatically pulled up into the atty as you vape. 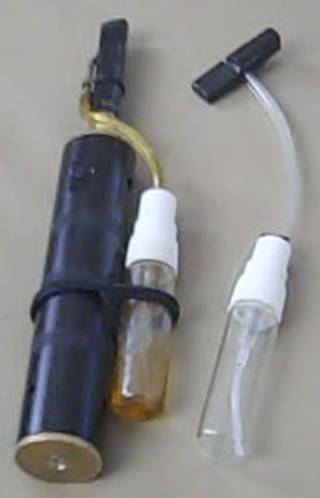 [NOTE: The GG AFS (Automatic Feeding System) V2 for use with other tubular mods no longer seems to be available.] FYI: GG mods and parts often are out of stock and can be finicky in performance. My perception of Imeo’s GGs is that they are the Jaguars of PVs: outstanding in concept and luxury, but often in the shop. And some mods don’t even have button that you press. 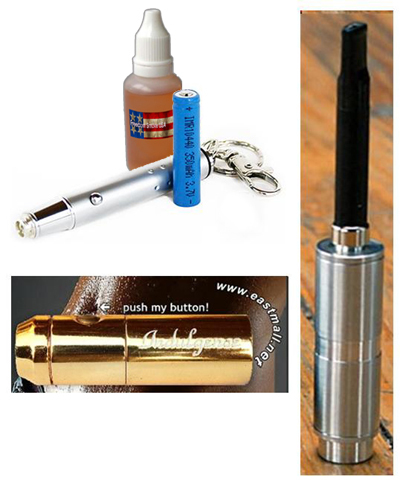 For example, the Copper is engaged by pushing down on the atomizer with the mouth. The Omega is similar, but you push down on the top of the mod with your finger to engage. The feel of the switch. Some buttons are big and fat; others are small and almost pointed. Some stick way out; others are recessed. Some aren’t even pressed, but are touch sensitive. Prices of mods and where to buy them have been shown throughout this section (and on ViZi’s website). 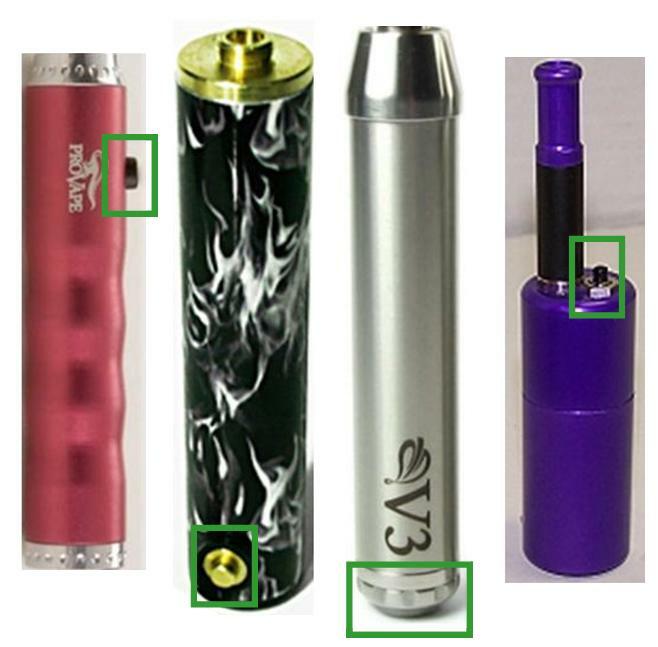 Except where noted otherwise, prices do not include batteries, charger, or atomizer. Expect to pay around $25-30 for those. $150-200 (e.g., for an Ali’i Variable Volt, Fist Pack, most GGs, Precise 18650, Precious-L, Multi-Voltage Tekk). The GG Telescopic Storm with AVS is $239. Shown below (and linked above) are some mods I never got around to mentioning previously. Surprisingly perhaps, small size, high/variable voltage, and features like juice feeding have relatively little impact on cost (any of those can be had for under $70) … unless you want the best of two to four of those in the same device (e.g., those models in the top two price brackets). High mAh has a greater impact (e.g., the least expensive 18650-based mods are the $80 Chuck and XHaler). But the most significant factors impacting price are: sophisticated engineering (e.g., as the shortest and thinnest mods for the batteries contained therein, the Precious and Precise are among the most expensive) and craftsmanship (e.g., the beautiful wooden Ali’i and P Woodie Feedie command higher price tags than the WetBox or MrPuffer). If you are overwhelmed and turned off … mods aren’t for you (yet). Or do you want the best of the best (by whatever criteria you care about) and have oodles of dollars (or pounds or euros) to splurge? You’ve seen here the models that fit the bill. Investigate them further: study the description and specs on suppliers’ websites … read reviews and watch review videos (e.g., those linked on ViZi’s site and by searching for them on the forums and YouTube) … and read forum posts by owners of those mods. And then … grab the tiger by the tail and go for it! Gobble Gobble: A Turkey Egg Hunt!